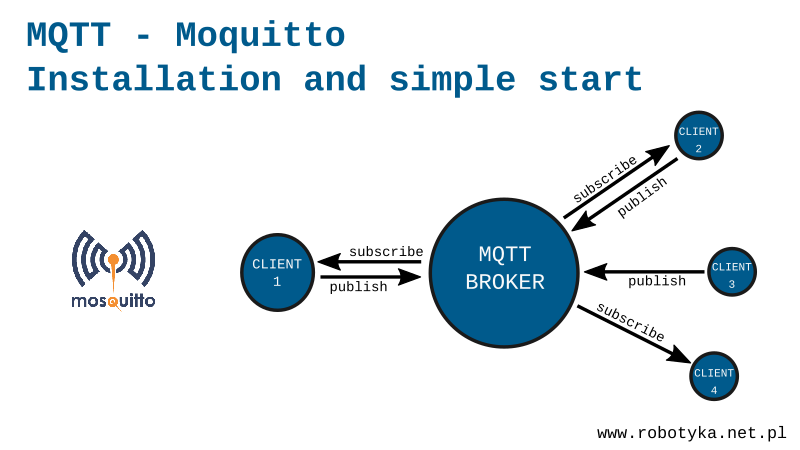 In the previous article I described the basic of the MQTT communication protocol, now I will discuss the practical use of communication using the Mosquitto broker. Mosquitto is a lightweight broker that supports the MQTT protocol provided by the Eclipse Foundation under the EPL/EDL license. This means that the broker Mosquitto is working properly. When we have a ready environment, we can begin this first test. To do this, we need to have open two terminal windows. mosquitto_pub -t myTopic -m "message"
When you call the publication command in a terminal window where we have opened a subscription we see our message. MQTT, of course, allows communication between different devices, the only thing the client application must know is the IP address of the device on which the broker works. For example, I run a Mosquitto server on a Raspberry Pi, which will also be one subscribing client, and I’ll start the publication and subscription for the PC. Mosquitto_pub -h 192.168.1.100 -t myTopic -m "message"
Because they run on a different device than the broker is running, we need to provide the IP address of our server. This is used for the -h [IP adres] argumentt. As can be seen from the above examples, MQTT is a very simple but powerful tool. The next section will show access control. This entry was posted in IoT (Internet of Things), Tutorials and tagged debian, mosquitto, mqtt, Raspberry Pi. Bookmark the permalink.